Whether you’re looking for the right place to choose for rehabilitation after surgery, a nurturing facility for a loved one who needs 24-hour care, or if you’re ready for a maintenance-free retirement lifestyle, we know you have a lot of questions. We have answers. Independent living is designed to support a full, comfortable lifestyle for seniors. It provides residents with activities, services and other amenities while freeing them from heavy housekeeping and home maintenance chores. Short-term nursing care centers provide housing, medical and rehabilitative therapies to people of all ages recovering from illness, injury or surgery in order to successfully transition from an acute care hospital stay to home. Rehabilitative therapies provided at short-term rehabilitation centers may include physical, occupational, speech and respiratory therapy. Short-term rehabilitation may also be referred to as “Skilled nursing care”. Care and therapies provided in this setting may be covered by Medicare. Long-term nursing care provides residents with accommodations, supervision, non-acute medical and nursing, and palliative care for those adults who have chronic or end of life conditions whose needs can no longer be safely met in the home. Medicare does not typically cover costs for long-term nursing care. The Medicaid program provides medical benefits to low-income people who have no or inadequate private insurance or funds for long-term care. In 1951 Amasa and Edna Pierce donated the land that PierceCare sits upon to the American Baptist Churches of Connecticut. Over the years PierceCare has expanded its services to provide the highest quality care for people of all faiths in a beautiful setting in northeast Connecticut. PierceCare is the only community in the area offering a continuum of residential living and care on one campus. We continually challenge ourselves to be a forward thinking organization in order to meet the needs of future generations of older adults here in the Quiet Corner. Who owns and operates PierceCare? Our community is a not-for-profit 501(c)3 corporation. A volunteer Board of Trustees determines the policies and articulates the vision and mission of PierceCare. 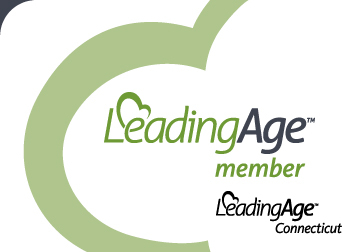 This dedicated group of individuals is comprised of representatives of the American Baptist Churches of Connecticut and members of local, northeastern Connecticut business and professional organizations. 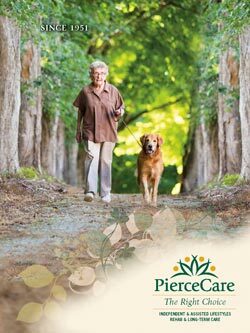 PierceCare is the only retirement community in northeast Connecticut offering a continuum of care on one campus. You’ll find a range of options for independent and assisted living at Creamery Brook Village, including nine styles of apartments ranging in size from 610 to 946 square feet and six duplex-style cottages that are 1,686 square feet. Pierce Memorial Baptist Nursing and Rehabilitation Center provides short-term rehabilitation and long-term nursing care in a choice of spacious, private rooms with en-suite private bath or double occupancy rooms for more affordability.